The court of appeals today filed a case which is recommended for publication. The case is Glidewell v. Glidewell, 2014AP1957. While the case seems appropriately decided, one has to wonder why it is recommended for publication as it does not address an important issue: The effect of DV on custody. 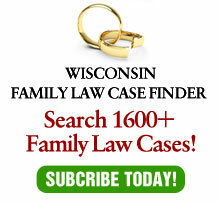 Â¶4…waived her right to raise the domestic violence presumption set forth in Wis. Stat. Â§ 767.41(2)(d) in this post-judgment motion because the domestic violence she relies on occurred prior to her original divorce judgment, at which time she stipulated to joint custody. Jill cannot now assert the domestic violence presumption based on the pre-divorce incident and without asserting any post-judgment domestic violence facts. This does not seem particularly revolutionary. In addition, it’s difficult to believe that this change-of-mind occurs frequently enough to warrant a published opinion. The opinion also affirms the order of Milwaukee Country Circuit Judge Fredrick Rosa in continuing joint legal custody, but awarding Jill final decision-making authority in the event of a dispute regarding medical care for the children and Herbert final decision-making authority in the event of a dispute regarding educational decisions for the children. The appellate court likewise affirmed this part of the order as a reasonable exercise of discretion. The issue which both the trial court and appellate court avoided by ruling that Jill had waived the DV presumption against joint custody is whether there is a conflict between this presumption and the best interests of children. Put another way, can a man (yes, DV can and does occur the other way around, but it’s far more common with the male being the perpetrator) be a DV perpetrator but still be an appropriate decision maker for minor children. To quote from The Wizard of OZ: “I’m a very good man. I’m just a very bad Wizard.” So, is it possible to be a very bad husband (and maybe even a very bad person) but still be a good (notice that I removed the modified “very”) father? Discuss amongst yourselves. This case does not answer that question.